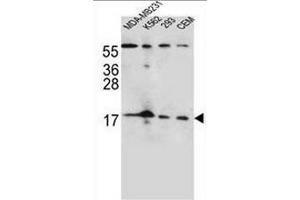 FGF22 Antibody (N-term) western blot analysis in MDA-MB231,K562,293,CEM cell line lysates (35µg/lane).This demonstrates the FGF22 antibody detected the FGF22 protein (arrow). Spezifität This antibody reacts to FGF22. Kreuzreaktivität (Details) Species reactivity (tested):Human. Applikations-hinweise Optimal working dilution should be determined by the investigator. Handhabung Avoid repeated freezing and thawing. Informationen zur Lagerung Store the antibody undiluted at 2-8 °C for one month or (in aliquots) at -20 °C for longer.